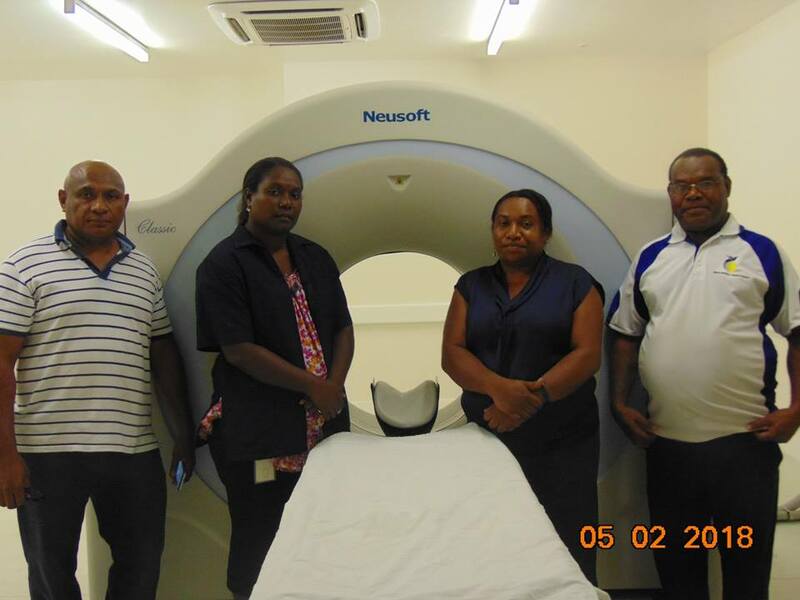 ANGAU Hospital now has a CT scanning machine after tests were conducted to ensure the machine was fully operational. Officer In Charge of the Medical Imaging Department Mr Tutty Selan confirmed this when a patient was placed in the machine and tests were done to confirm the extent of injuries the patient had sustained. Mr Selan said the machine can cater for 30 patients every day and that will ensure many injuries and serious illnesses are detected that can enable doctors to save patients at the early stages of illnesses. The CT Scan Machine which had been stored away in the hospital's Medical Imaging Department was finally tested and commissioned for use and will be fully operational begining this year. It is another development in the ongoing redevelopment of ANGAU Hospital. Pictured is Mr Selan with his staff from the Medical Imaging Department.